Kim’s hobbies include spending time with her family, watching her son’s baseball games, practicing yoga, meditating, skiing, and horseback riding. After 25 years of treating patients and conducting breast cancer research, Kim recently left her position in academic medicine to focus her efforts on getting new drugs to patients facing cancer. When she was younger, Kim loved animals and biology. She was convinced she wanted to become a veterinarian. However, after spending a summer working with a veterinarian, Kim discovered that medical school might be a better fit for her. The fields of cancer and HIV research were really emerging when Kim was in high school, and she knew she wanted to go to medical school after college. Kim chose to major in bioethics in college based on advice she received that she should major in something that she wouldn’t be able to study in-depth in medical school. This was one of the best decisions Kim has made. A liberal arts mindset and excellent critical thinking skills have helped Kim become a better doctor, and they have been assets in her career. Kim had an opportunity, through a college work-study program, to work with women who were undergoing intensive treatments for breast cancer. These brave women were inspiring and had a lasting impact on her. About 10 years ago, Kim became determined to do science-based clinical trials on a global basis. She worked with the Susan G. Komen Foundation, got a grant, and began planning clinical trials to take place in China that were similar to the trials that had been performed in the United States. She assumed that since the clinical trials in the U.S. went well, the ones in China would also be a success. However, Kim didn’t have a good understanding of medical practice in China at the time. She didn’t take into consideration how care was delivered in China or the culture of the women receiving treatment for breast cancer there. As a result, they couldn’t get enough patients enrolled in the clinical trials, they weren’t able to get the answers they needed for their research questions, and the trials didn’t work. This was devastating because she spent about five years working towards a grand vision that never came to fruition. Through this experience, Kim learned a valuable lesson in the importance of strategy in executing clinical trials, and this is something that still impacts clinical trials today. Kim spent about two years working in the lab trying to develop breast cancer models in mice where the tumors were resistant to the endocrine therapies they were using. It was tedious and frustrating work. However, she finally developed a tumor that was resistant to the treatment they were studying. She sent the tumor to a clinical laboratory to test it for the same set of markers that are assessed in human tumors. Kim did this without considering the many potential methodological limitations in using testing methods for human tumors on a mouse tumor, but fortunately the testing worked. In trying to make these tumors resistant to their particular therapies, the tumors also became HER2 positive. This gene mutation was just beginning to be targeted at the time she started this work, and the scientific community was very interested in the model she developed. The tumor model Kim developed is still being used in research today, which is really rewarding. In addition to this advance that benefitted laboratory research, Kim was approached by people who had developed a treatment and wanted to work with her to test it in her model system. Kim was the first person to study this now-approved breast cancer treatment in the model system she developed. She led the early studies of this therapeutic, saw the promising results in animal models, and then was able to see it used to help people. This was a truly amazing experience. Kim’s initial discovery led to a series of other discoveries that eventually led to this new treatment for breast cancer. Traveling to Kenya to work in a field hospital was an unforgettable experience for Kim. It was overwhelming at times to be responsible for treating people coming in with a wide range of conditions from serious infections to lion attacks, but it was wonderful to be able to help people. Kim’s time spent in China trying to prepare and conduct global clinical trials was also particularly memorable. In addition, Kim had the opportunity to travel to India when the new breast cancer treatment she helped develop became available there. The government invited her to tour some of the hospitals, and she really appreciated being able to see the impact of her work on people’s lives. For people in many areas, intravenous-based therapies aren’t as accessible, so this new pill-based cancer therapeutic really made a difference in the care of patients there. Kim fondly remembers the myriad of competitions they used to have in the lab. They would create competitions around everything, from who had the worst Western Blot to whose cell culture hood grew the most fungus in one year. There were awards for the winners of these competitions, and it added an element of humor to their everyday work. In her clinical work, they used to keep a dry erase board full of funny quotes from colleagues. Looking back over the board and sharing funny quotes was a good way to bring everyone together for a good laugh. Maintaining balance in your life is important. Set your priorities, and make sure you prioritize the things in life that are very important. Kim has played a major role in developing therapies that represent revolutionary non-chemotherapy based approaches for treating breast cancer. 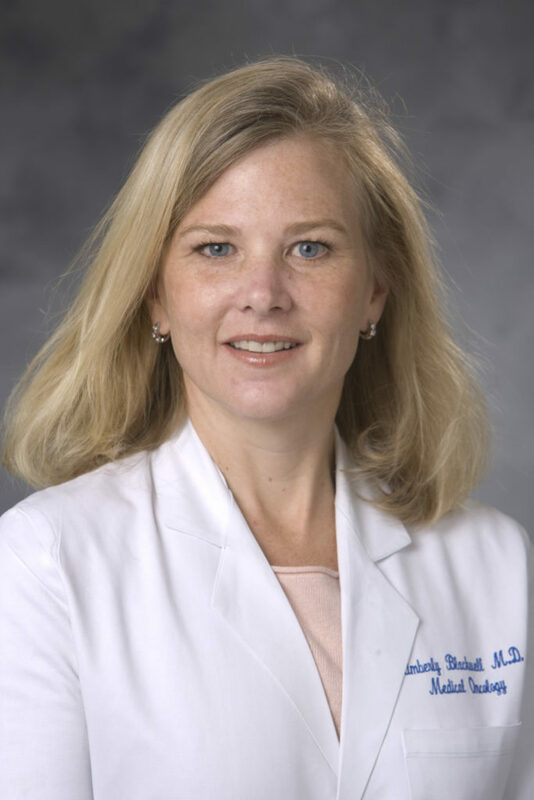 Her clinical and research interests include various topics in breast cancer including endocrine therapy, novel HER2 therapies, breast cancer vaccines, and other experimental therapeutics. She has studied and served as the principal investigator on studies that led to regulatory approval of four cancer agents, including the first biosimilar treatment for cancer in the United States. Kim’s goal in her recent career transition from academic medicine to industry is to help bring new cancer treatments to patients faster.